In 1977, LEGO® tried something new in Europe, something which was called a "Technical Set". The term Technic would not be coined until later. These new sets still used much of the traditional studded construction of other LEGO® sets, but now introduced a small number of new parts which could be used to reproduce realistic technical functions. There were gears and axles, and new special beams and plates with holes in them to allow installation of the axles. There was even a piston element which could be used to accurately reproduce the lower part of a reciprocating engine. The four sets released that year showcased some the possibilities of these new parts in an impressive way, but these same parts would be used in an increasingly complex fashion in future years. Three sets had rack and pinion steering, and the forklift also used the rack gears to translate the lift. The tractor used a four bar linkage to lift the various implements which could attach. The helicopter had collective pitch using pins for rotation axes. The auto chassis used a little bit of everything, and had a working inline 4 cylinder engine with a 2 speed gearbox. Most of these models had minimal exterior styling, but each instruction book included a sizable section with ideas for either expanding the model or combining the parts with other models to make something different or bigger. This instruction supplement was just as lengthy as the manual. These sets were not available in the USA for the next year or two, and by then they would get a new name for the series, "Expert Builder". All the Technic parts were new in 1977! 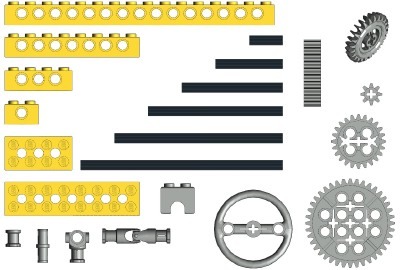 The basic set of parts is shown to the right. This comprises all of the new parts which were included in the sets, but does not include the motor or battery box which were available as an accessory pack. 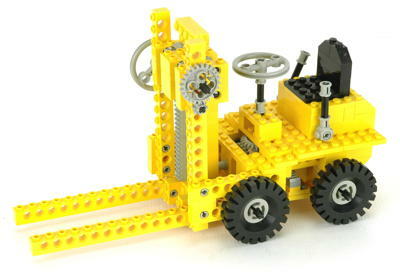 The "standard" Technic parts, which have now become ubiquitous, are the plate and the beam. Beams are just like 1x bricks, but have perpendicular holes at points midway between the studs. Technic plates are just like regular 2x plates, but have parallel holes at points midway between the studs. These holes are sized to accept either pins or axles. Beams originally came only in even lengths: 2, 4, 8, and 16. Plates came only in 2x4 and 2x8. Many more sizes would later be available. Studded beams are still in use though they have mostly been replaced by links. Most technical functions were and still are accomplished with gears. In 1977, there were three sizes of spur gears (gears which transmit torque on parallel axes): 8 tooth, 24 tooth, and 40 tooth. The two larger gears also have axle holes and stud holes off the center which allow them to be used for other purposes (such as a crankshaft). There was also a 24 tooth crown gear which could be used as either a spur gear or a bevel gear (gears which transmit torque on perpendicular axes), and a rack gear. The 8 tooth gear is still in use, but the others have been replaced with improved versions. The 40 tooth gear still exists but has been used in very few sets. Axles are the basic unit of torque transmittal in Technic. LEGO chose to use a cruciform cross section. This has the advantage of never slipping, being easy to assemble, and centering well in a hole. Axles are the same size as a stud in diameter, and originally came in only even lengths: 2, 4, 6, 8, 10, and 12, and they were always black. These are all still in use although the 2 axle has been modified and odd lengths are now available, as are other colors. The bushing was used as either a spacer or a retainer and fit onto an axle. The pin was frictionless and was used to joint two beams or as a pivot. The connector fit onto the end of an axle and included a perpendicular hole which would accept a pin. It could also be used as a connecting rod for the piston. The universal joint connected two axles and allowed rotation around axes angled apart as much as 45 degrees. The pulley was used only as a crank in 1977, but would later also be used with belts. These parts could all be used in multiple applications, but only the piston had a single use. The 2x2 square piston was used for engines, and had to be used with a connector element. At this time, these parts were available only in light gray. 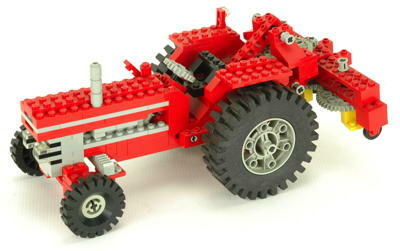 LEGO® already had lots of wheels and tires, but they were not big enough for some of the new sets. 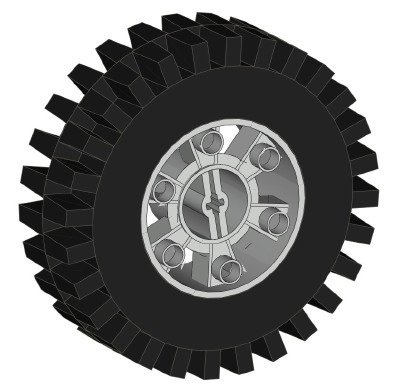 A new 24x43 wheel was introduced with a dense foam tire. This tire was later available in other sizes, and would eventually be replaced by all rubber tires.